Melt-Growth of III-V Compounds by the Liquid Encapsulation and Horizontal Growth Techniques (J.B. Mullin). 2. Liquid Phase Epitaxial Growth (N. Tabatabaie, V.M. Robbins, G.E. Stillman). 3. Vapor Phase Epitaxy of III-V Semiconductors (R.T. Green, C.M. Wolfe). 4. Metalorganic Chemical Vapor Deposition of III-V Semiconductors (P.D. Dapkus, J.J. Coleman). 5. Molecular Beam Epitaxy (S. Sakaki). 6. Ion Implantation in III-V Semiconductors (J.P. Donnelly). 7. Characterization of III-V Semiconductors (D.C. Reynolds, N.C. Look). 8. III-V Semiconductor Devices (H. Beneking). Subject Index. 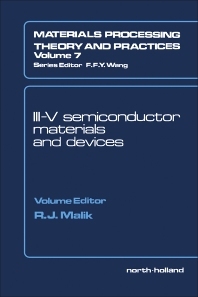 The main emphasis of this volume is on III-V semiconductor epitaxial and bulk crystal growth techniques. Chapters are also included on material characterization and ion implantation. In order to put these growth techniques into perspective a thorough review of the physics and technology of III-V devices is presented. This is the first book of its kind to discuss the theory of the various crystal growth techniques in relation to their advantages and limitations for use in III-V semiconductor devices.